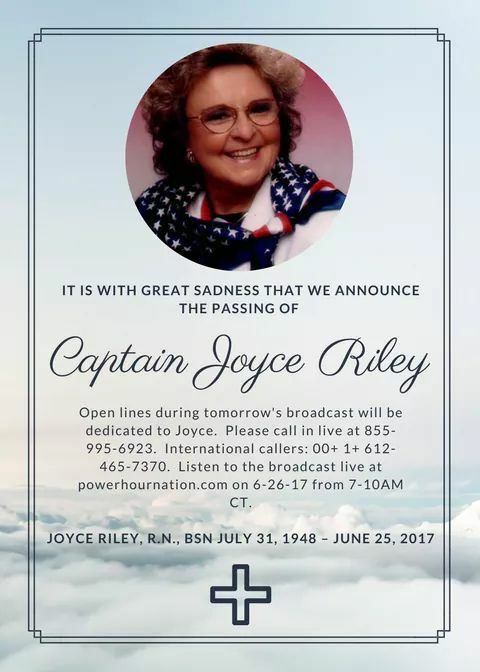 She was a radio talk show host based in Versailles, Missouri. It is with the greatest of sadness that we deliver to you today the heartbreaking news of the death of our friend and fellow patriot Joyce Riley. Joyce died peacefully on June 25, 2017. She was the narrator behind the film Beyond Treason and hosted The Power Hour, often with former co-host Dave vonKleist, the narrator of 911 In Plane Sight. Riley was battling cancer and that fight ended today.